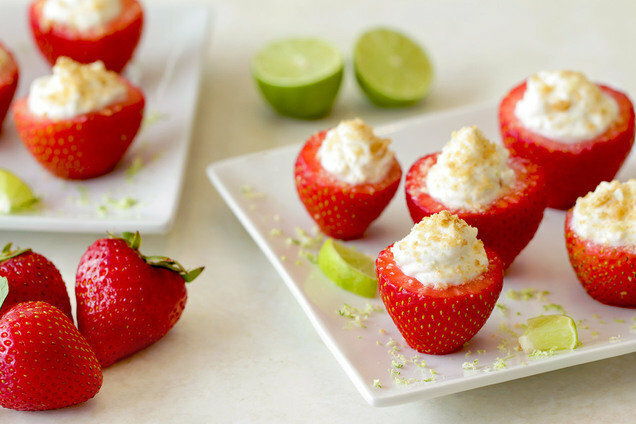 Key lime pie and strawberries were destined to be together. Words cannot describe how much you'll love this recipe! Slice the stem ends off the strawberries, about 1/2 inch below the stem, revealing an opening in each berry. Use a narrow spoon to remove about half of the flesh inside each berry, allowing room for filling. In a small bowl, combine all remaining ingredients except graham cracker. Spoon yogurt mixture into a bottom corner of a plastic bag; snip off the tip of that corner to create a small hole, and squeeze the mixture into the strawberries. Sprinkle with crushed graham cracker. HG Tips: Cut a thin slice off the bottom of each strawberry, so the berries sit flat. Use a grapefruit spoon (like this one) to scoop out the flesh of the berries. Decadent cheesecake goodness is just a few steps away. No oven needed! 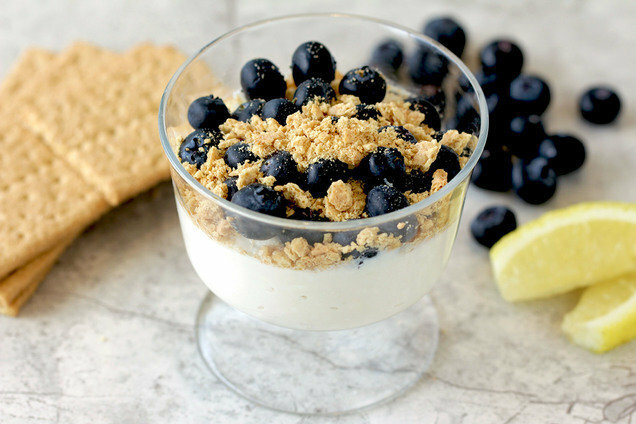 In a medium-small bowl, combine all ingredients except blueberries and crushed graham crackers. Mix well. Top with blueberries and crushed graham crackers. HG Tip: If starting with frozen blueberries, make sure no sugar has been added. Today, June 1st, is Flip a Coin Day. Can't decide whether to make Buffalo Chicken Tacos or Chicken 'n Waffle Tacos? Flip a coin! Don't let your pals be sad and sans dessert! Click "Send to a Friend" or forward these recipes now.